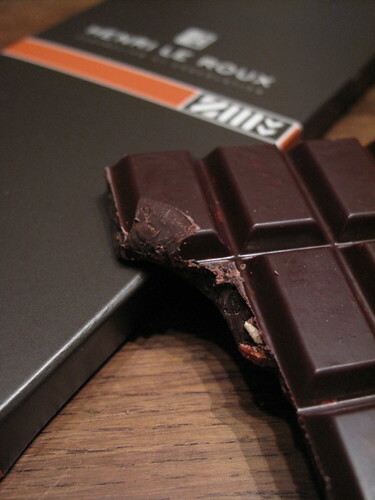 Switzerland’s first Salon du Chocolat is in just two months, in Zürich on March 30th, 2012. 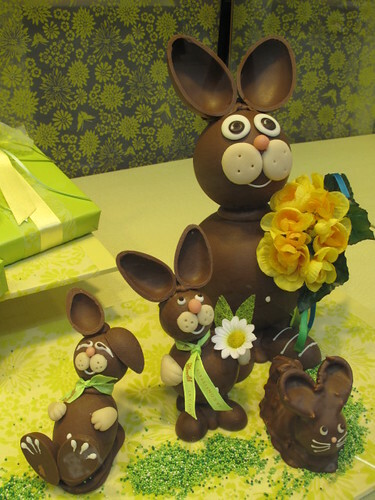 You may think I can’t possibly have chocolate on my mind any more than I already do, but… everything is possible. Helping to organize this delicious event, meeting with chocolatiers and pastry chefs, and talking about chocolate around the clock brings on even more cravings than usual. 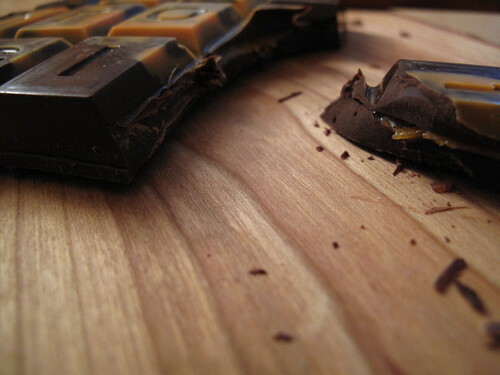 Luckily my chocolate stash is always overflowing with new bars to taste. While most of these tastings are of Swiss chocolate, I thought I would highlight a few non-Swiss wrappers that are now part of my collection. There is no better place to start than with a current favorite of mine. 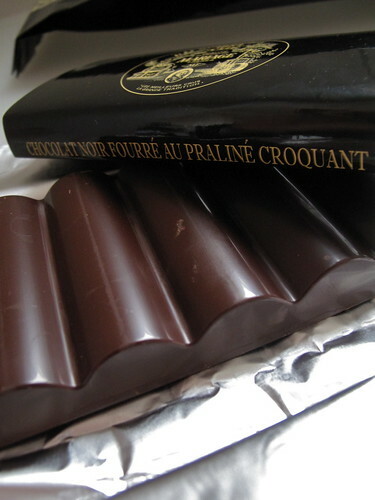 I have always been a fan of Henri Le Roux’s silky salted butter caramels (he’s the inventor of the famous CBS – caramel au beurre salé) and individual chocolates with buckwheat, but I have only more recently discovered his bars, thanks to the Salon du Chocolat in Paris. 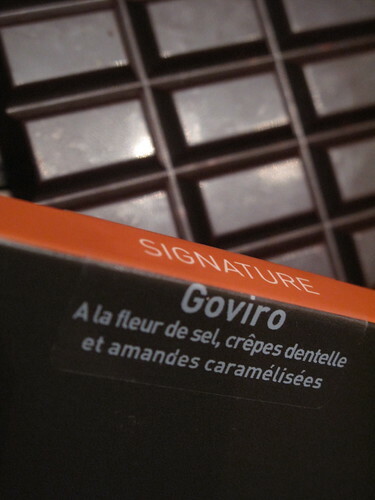 One word, people: Goviro. 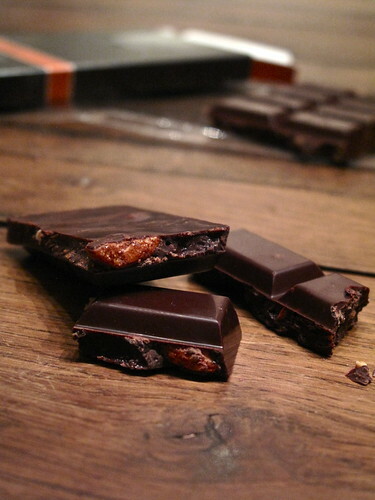 Fleur de sel, crêpes dentelle (super thin, crispy golden butter biscuits) and caramelized almonds in smooth dark chocolate – that is the recipe for a stellar bar – and an addiction. 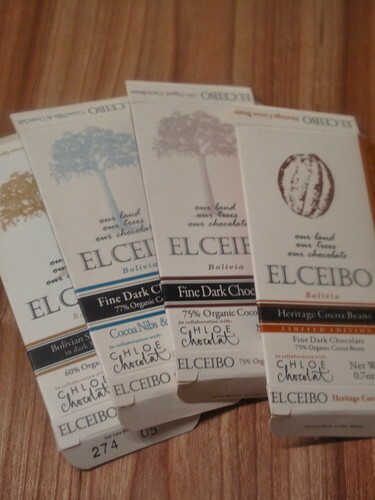 Thanks to Le Roux’s new shop in Paris’ St German des Prés (in addition to those in Brittany on France’s west coast), I have a few more of those Goviro bars, as well as the Embruns bar with just fleur de sel, and the dark chocolate bar with coffee. 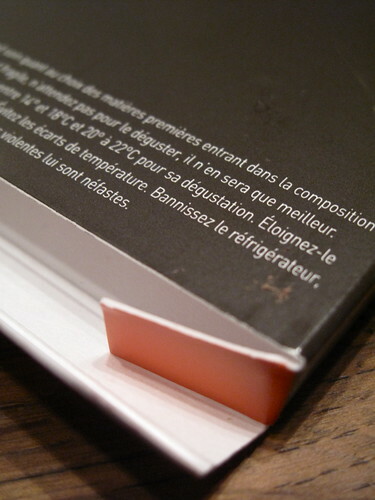 I love the look of the square bar above right/below left. 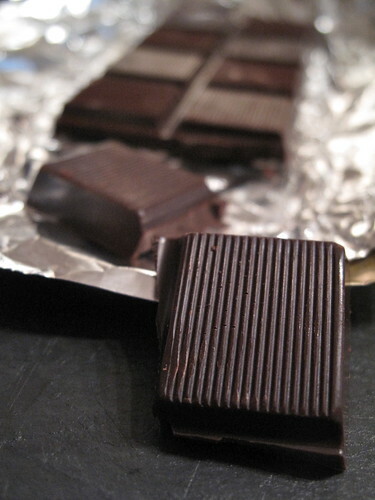 They are all kept safe in a cool, dry space – heeding the golden rule on the packaging, “do not refrigerate.” Really, do not refrigerate chocolate – ever. 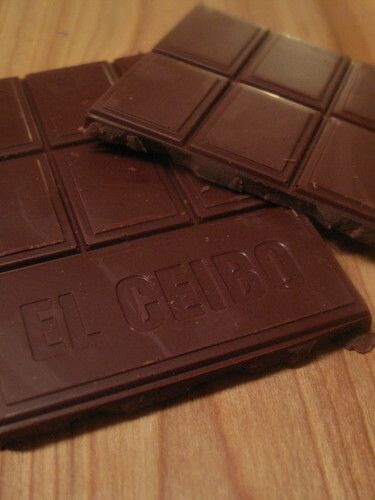 El Ceibo’s two pure dark chocolate bars both have an incredible smoothness to them as well, without the addition of milk, and a unique flavor that sets them apart from other chocolate you may have tasted (75% fine dark chocolate and a limited edition with heritage cocoa beans). 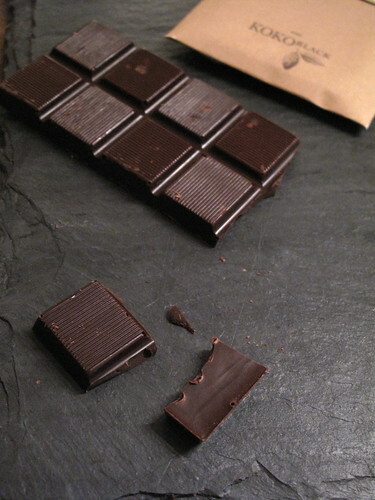 The final bar in the line, 77% dark chocolate with cocoa nibs and Uyuni salt from the world’s largest salt flat (also in Bolivia), masterfully combines dark, crunchy, bitter (nibs), fresh (salt) and intense. 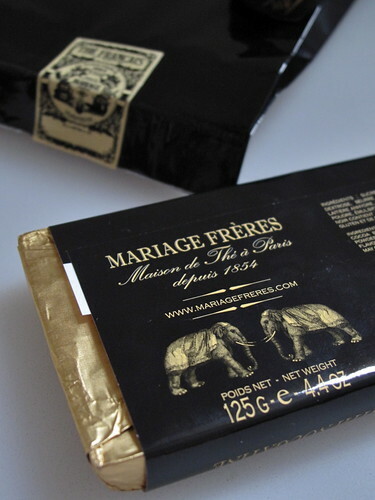 Another French name that many of you may recognize is Mariage Frères. But for tea, not chocolate, right ? Waiting in line to pick up a tea order for a friend in this very exclusive, elegant tea room, I noticed a few chocolate bars on the wall. What was my natural reaction ? 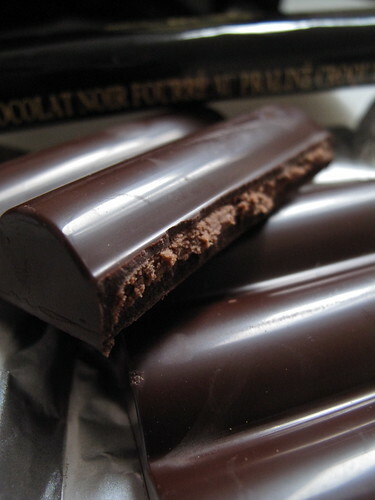 To get one of course, especially when I saw there was a dark chocolate bar filled with “praliné croquant” – two words each a weakness of mine, and together, I clearly had no choice. 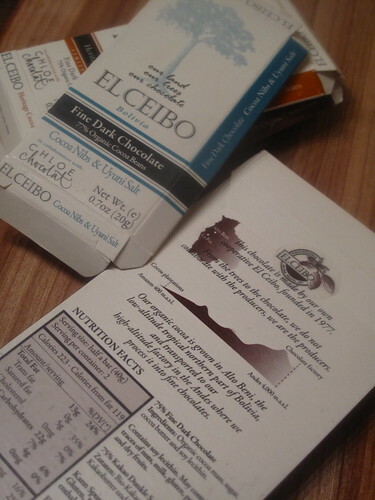 I would be curious to learn more about the chocolate they are using, which was smooth and of a high quality; and this bar had a light praliné filling. 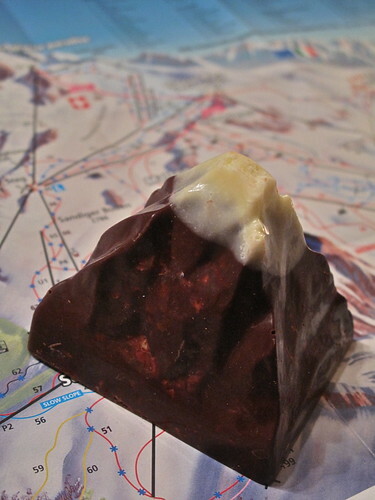 There isn’t quite enough crunch to warrant the croquant in the name though. Overall, a pleasant surprise that made waiting in line well worth it. Lastly, while there have been many countries in the previous nine chocolate roundups that may not immediately come to mind when we think of chocolate, like Croatia, Slovenia, Poland and New Zealand, here’s another first appearance… Australia. 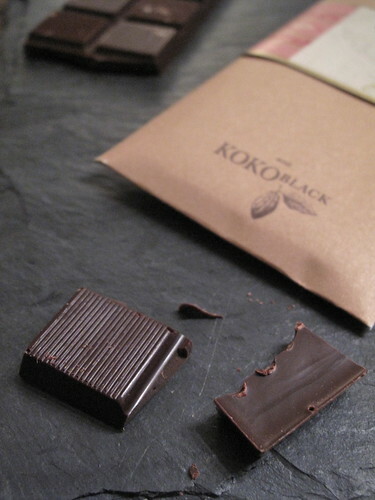 Luckily I have a friend Down Under who contributes to my sweet discoveries around the world, this one from Koko Black in Melbourne. 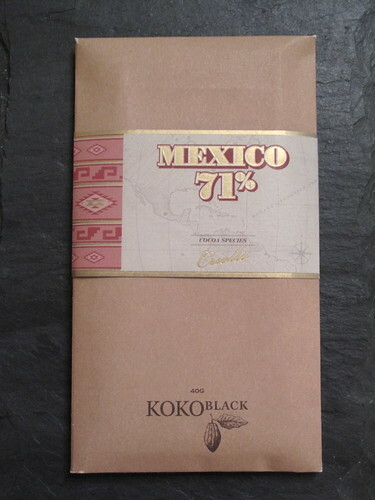 The Criollo beans in this single origin bar were from Mexico. 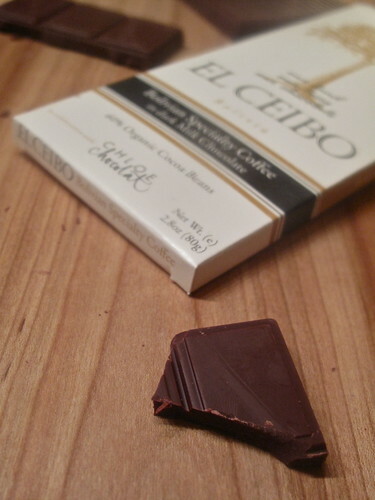 If you think about how chocolate was consumed in Mexico, as a beverage blended with spices, you may not be surprised that this bar is not at all sweet either, with “a very earthy, smoky character.” I love the size, thickness, snap and texture of this bar, and would recommend it to someone who likes their chocolate with savory notes. 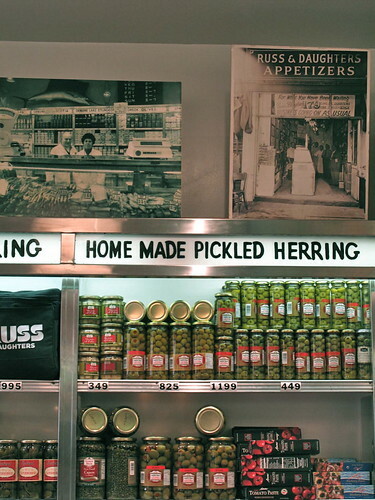 What have you all tasted lately ? IF you ever give a course on chocolate I will register. 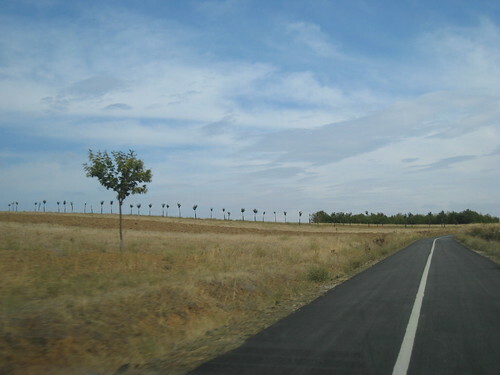 So much that I’ve been learning just by following your blog. Thank you. 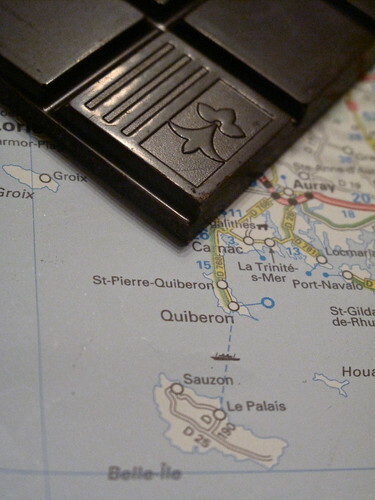 This description – Fleur de sel, crêpes dentelle (super thin, crispy golden butter biscuits) and caramelized almonds in smooth dark chocolate – that is the recipe for a stellar bar – and an addiction, has made me add this bar to my purchases when in Paris in early March. 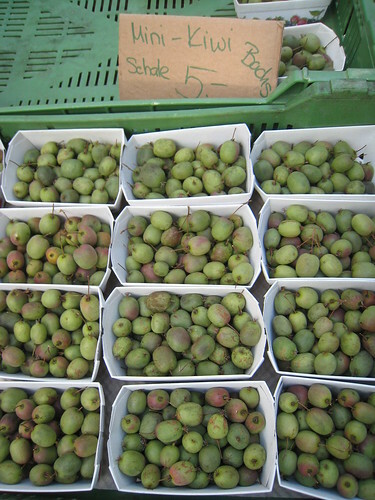 These short trips came to being as part of my new ‘sweet education’ that has taken shape because of MY Kugelhopf. But hey ho, it’s 2012 – and although no NY’s resolutions were taken (apart from being – even – more Zen…) I just HAVE to do something to lose a bit of weight. And then comes dear Kerrin with a hand full of the most delicious choco photos and a poetic trip through several choc’s heavens…. gooory glory! 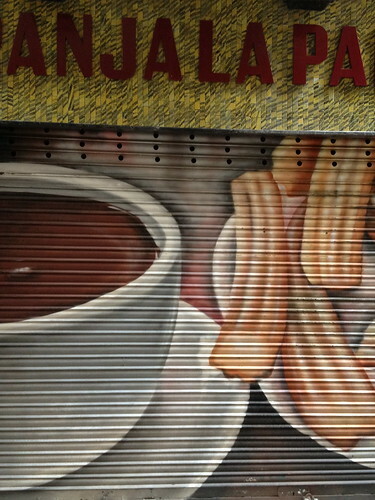 Luckily I’m not into sweets…. lol! Honestly, a very tempting trip you’re proposing and I can throw in a BRAVO just before fainting with weakness! 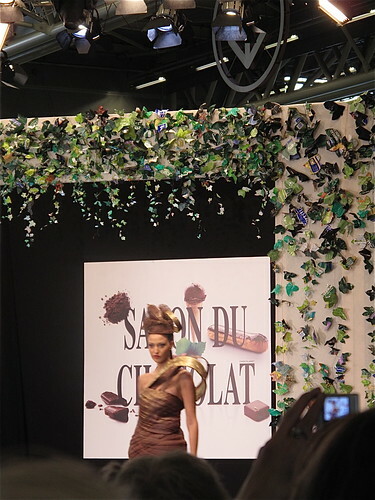 Who better than you to help organize the salon du chocolat??? Way to go! I am soooo proud of you! yum yum yum…. need I say more. We are looking to travel this April and just digging around for tips on where to go and what to see, do and EAT! This was a great article with yummy tips. Thanks for the insight. valentina, I love contributing to your sweet education. 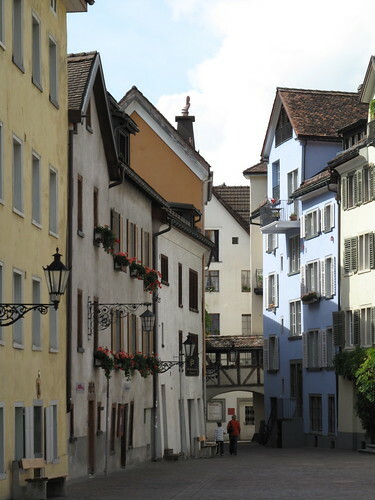 And we’ll get to continue face to face on a Sweet Zürich tour soon too ! 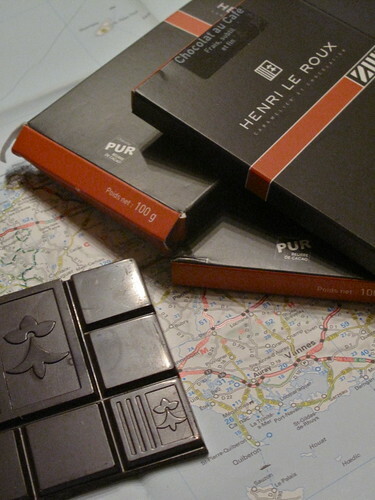 Definitely put Henri Le Roux’s shop on your Paris must visit list, so many incredible things to taste there, including his outstanding caramels. Kiki, OOPS ! Didn’t mean to throw temptations at you like that ! 😉 But sounds like you are able to resist – still don’t understand how you can “not be into sweets.” ?! Julia, if only you could see the collection of chocolate papers here, you’d believe I could more realistically be at Chocolate Roundup #50 right now ! haha ! 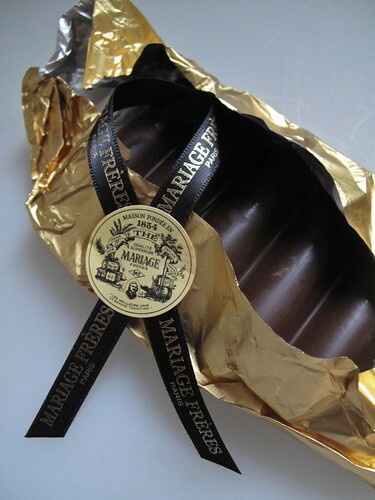 Love your “bait and switch” comment about Mariages Frères. 😉 A delicious diversion indeed. Ruvi, thank you – and my pleasure. 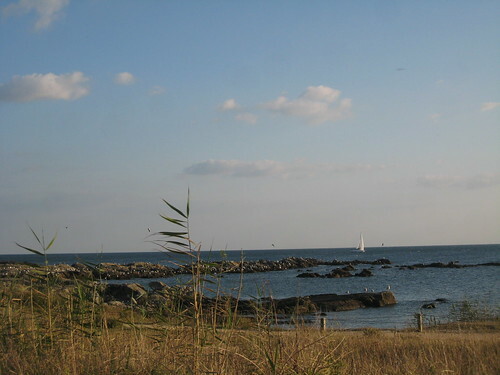 Hope you enjoy your travels in April ! 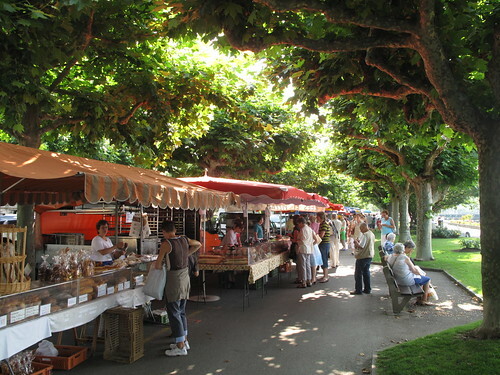 Kerrin; the shot I call ‘the bite’ above doesn’t let me get my sleep….. and now I find on one of the blogs I follow loosely here another sweet link, going to Richard in Paris, talking about Henri Le Roux…. Great information about the stuff we almost daily eat and never think in that way to know something about it.I like your detailed shots with that marks of teeth. Nice round-up Kerrin! I’ll have to try the Goviro then, it’s going right at the top of my shopping list.